Exchange components carry an excellent warranty. Convenience – Exchange is an additional repair option that is available throughout our territory. Enables the technician to complete the job quickly. When using exchange components, technicians do not spend time repairing components. Instead, they only incur the time required to remove and install the component. Quality repairs. 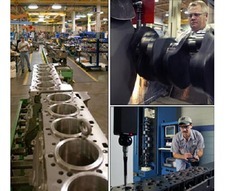 Components are remanufactured to CAT specifications using the latest technology. They are then tested to ensure proper operation. Provides faster turnaround time for major repairs.